Annoyed with cat litter all over your floors? This is how you can solve the problem. "Is it possible to have cat litter that doesn't leave the litter box?" To give you a way out and relief to your scattered-across-the-floor-litter predicament—Yes, it is possible! It’s called Non-Tracking Cat Litter, and we’re oh, so happy about it—seriously, four paws in the air for this one. Shortly after your cat uses the litter box, the tiny granules of litter get lodge and stuck in-between their toes, which then transfer all around your home. And the more of a digger that your cat is, the higher the chances are that the litter will still somehow lodge into their paws and hold on for dear life. Non-Tracking Cat Litter are designed to keep the scattering of litter to a minimum and can be done through clumping or non-clumping cat litter. You can also opt for litter that is made from crystals or pellets. It may seem like you're taking too far when trying to literally analyze micro-crystals in your kitty’s litter, but it actually is a factor of the non-tracking litter that makes all the difference. The trick with the size of the granule is a quote taken straight from Texas—the bigger, the better. Large granules are less likely to stay on your cat’s fur, and he or she is much more likely to realize it’s hitching a ride and shake them off—before they leave the litter box. Not only is the size of the granule important, it’s also the shape. Even though you had hardly given this much thought about size and shape on your engagement ring, you should really hone in on the details of your kitty’s litter granules—it’s extremely important. The shape of the granule can determine whether or not it’s going to be easily attached to your cat’s fur. The litter that is shaped like barbs or like little hooks can easily latch on and not let go—until the opportune moment. Instead of grabbing your microscope slides and coverslips, you can quickly determine what the shapes are based on the litter description or the brand’s reputation. It’s a question that has littered (pun intended) the history books for ages—should you go for clumping or non-clumping litter? Although you might think this is a no-brainer, each side has its advantages; either one is good for a non-tracking litter. Even though clumping litter is easier to pick up and clean afterward, it is more likely to be tracked into your home because they are serving their purpose of merging together and hanging on. The non-clumping litter is less likely to track because it stays as tiny separated granules, but when it does, it’s a pain to clean up and get every little granule. An important feature to factor into your purchasing decision is if the litter is also hypoallergenic. Not only do you need to look out for the allergies you or a human family member may have to the non-tracking cat litter, you should always watch out for your cat, as well. If you opt for a hypoallergenic cat litter, this will omit the possibility that any of your family members (furry or semi-furry) will be allergic to it and peace can be restored. The best way to do that? Keep it dust-free. Simply by pouring out or shaking the litter while it’s coming out of the bag might be producing dust in your home that not only makes a mess but can also set off allergic reactions. Opting for a cat litter that is free from all of that mess can really help you out in the long run. Especially since litter’s main job is to keep odor and moisture to a minimum, they are some of the most important features to look for when selecting non-tracking litters. Generally speaking, opting for clumping litter will increase the chances of a better absorption and moisture control since it is designed to pack it all in. The goal here is for the scent of the litter—before and after the deed has been done—to be kept to a minimum and possibly non-existent. Even though you should be looking for cat litter that is odor-absorbing, be careful with the scented litter that might throw your cat off. They are sensitive creatures who are very strongly-opinionated. Speaking of opinions and preferences of your feline friend, if your cat doesn't like it, ultimately, they won’t use it! It’s a frustrating concept to understand, but even though it’s going to make you and your human family happier, healthier, and your home cleaner, your cat might not really approve it—ushering you quickly on the search again for a more, feline-approved non-tracking cat litter. 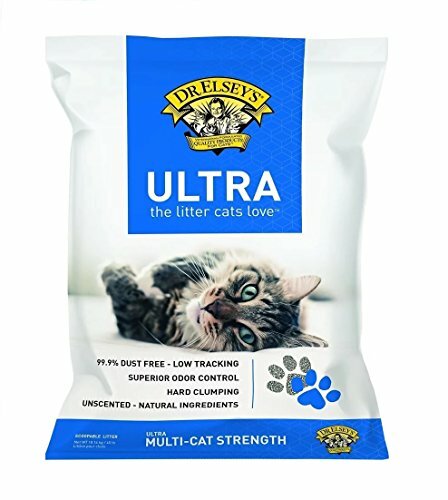 Perfect for those using a sifting or mechanical litter box, Dr. Elsey’s Cat Litter uses clumping technology to help keep the litter inside the box. The hypo-allergenic litter contains absolutely no plant proteins, no perfumes, nor deodorants, making it perfect for the family who has a feline and allergies. The litter soaks up as much moisture as possible and is also 99% dust-free, making cleaning for you less of a mess. Dr. Elsey’s products come from a veterinarian for over three decades—who took his passion for helping cats and their owners lead healthier and happier lives and turned them into physical products. From litter box solutions to keep it clean to nutritional protein to implement in your cat’s diet, Dr. Elsey has it all to give your cat the best chance at a healthy and active lifestyle. 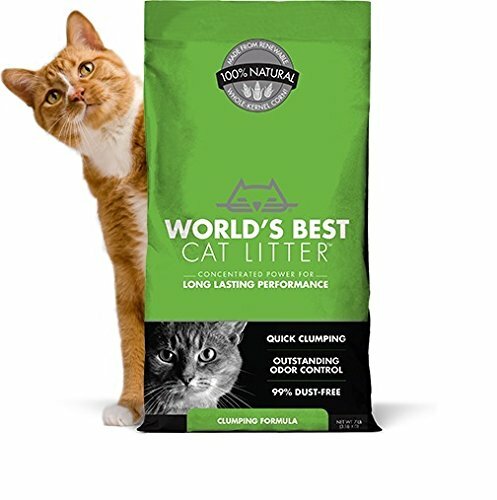 If you are looking for a product that eliminates odors and stops litter in its tracks (literally), this product is for you and your cat. Not only does it boast superior odor control, but it is also one of hardest clumping litters out there. 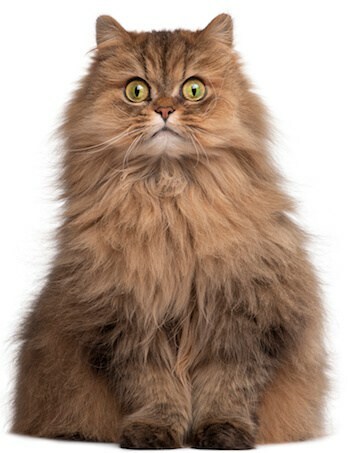 Unfortunately, the clumping can get a little out of control if your kitty’s paws are wet, forcing you to perform an immediate hair-cut or two. + Sensibly-priced product and a variety in the package-size so you're not getting too little or too much. - If your cat has sensitive paws, it may clump too hard on them and be an uncomfortable experience. This kitty leader is low-tracking and contains superior odor control. It also boasts a hard-clumping solution to lessen the necessity to clean after your cat steps to fit the box. It uses hypo-allergenic ingredients that are also all-natural and contain absolutely no plant proteins. It also has multi-cat strength if you have more cats than just one feline pal in the house. This product is great for an allergy-prone home that needs hard-clumping litter. For their biggest size yet, the Arm & Hammer Clumping Litter is perfect for your home if you are hosting quite a few cats. With a 40 lb bag, you can easily have enough litter for multiple cats, with the bag boasting a 7-day odor-free seal. This is one of their best products on the market because of its size and quality. Arm & Hammer is the household-known brand for baking soda. Their product line of laundry, cat litter, personal care products, and toothpaste products are all made with Arm & Hammer Baking Soda, which is quality that you can see throughout their long history and invaluable reputation. They are rated as America’s #1 Trusted Baking Soda Brand, whose formula is then implemented into your home under cleaning pet care - for the quality you, your cat, and your home deserves. This litter is easy and practical to use and clean up. Not only does it mask most foul odors there is also little to no dust when pouring or using the litter. The clumping is also a great feature that makes cleaning a much easier task. The freshness is also retained for a week and sometimes longer. + Using baking soda formula, there is no acid production and no bacteria growth in the litter. + It is backed by science—proving that sodium bicarbonate neutralizes acid production and keeps tracking to a minimum. + The material is soft and nonabrasive to your cat, meaning that they won’t feel uncomfortable or left with sticking litter granules in their paws. + A 7-day odor-free guarantee approval that actually works. + Perfect for a multi-cat household. - The scent that masks the odor might be too strong for your cat. - The litter is exceptionally absorbent, which makes it extremely heavy when not picked up after a while. 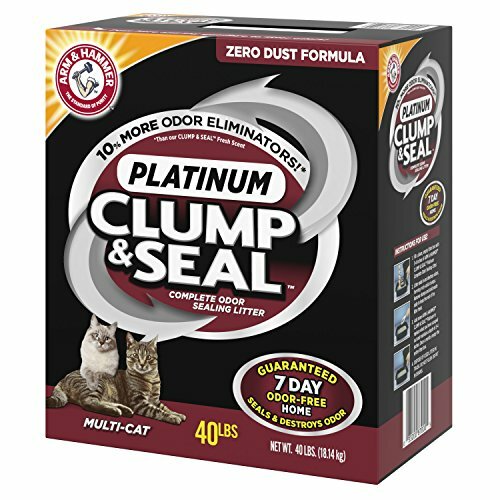 The Arm & Hammer Multi-Cat Clump & Seal Clumping Litter contains a patented formula that seals and destroys odor on contact, making it extremely reliable in keeping your house feeling fresh and your cat’s litter box as clean as possible and easier to clean. The formula also assures rock-hard clumps to make your life easier. You can also rely on their 7-day odor-free home guarantee and their 100% dust-free platinum formula. This product is perfect for a multiple-cat household that needs ultimate odor-protection. 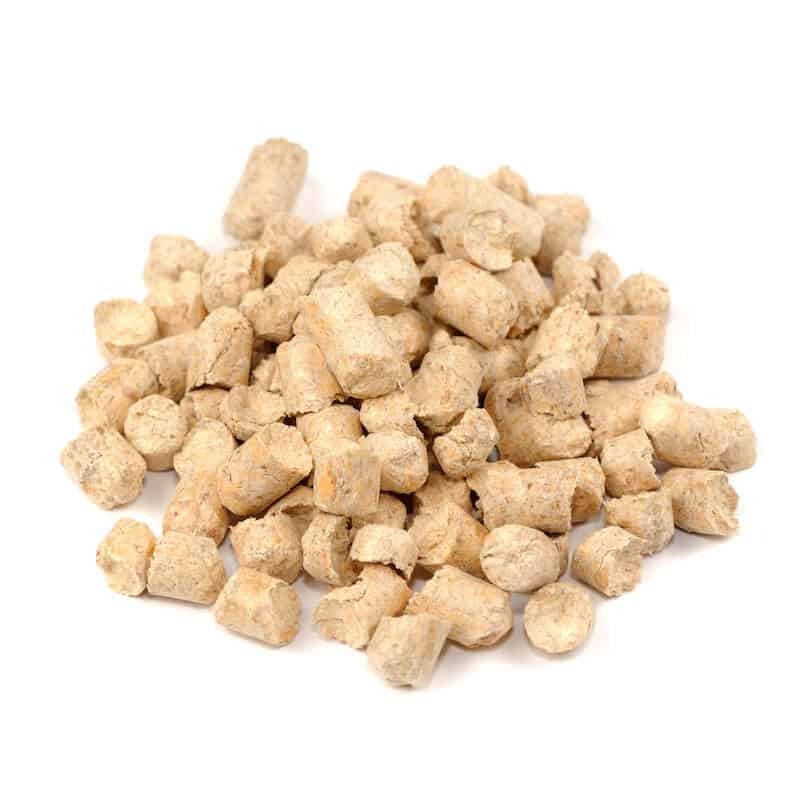 Those who are looking for an efficient clumping, non-tracking cat litter but also care about the environment. The product is flushable, biodegradable, and organic, making it a perfect addition to any environmentally friendly household. It actually boasts to being pet, people, and planet friendly, which we found to be pretty catchy. It also has minimal to absolutely no dust when being used or poured, which can help you if you have allergies and is pretty light—which is great for your back! The brand, World’s Best Cat Litter not only designs their products with the Earth in mind, but they also give back to the cat community, making the world a better place altogether. When you purchase their brand, it supports GiveLitter, which is a program that donates cat litter to shelters each year. They have donated over 662,000 pounds so far. The litter is actually made from whole kernel corn, which eliminates the toxicity features found in most other litter that contain wheat grass, beet pulp, oat hulls, etc. The product also boasts outstanding odor control, clumps on contact to make for easy scooping and cleaning, and is actually septic-safe—meaning its flushable! + Dust-free and odor-free (even scent-free). + Extremely lightweight when having to empty it or pour it in. - Since it is lightweight, it can cause some trouble if your cat likes to perch on the edge of the litter box. - It is a bit pricey and more difficult to find. Especially if you are less tolerant to allergies and dust, you should invest in this cat litter product, which is not only non-tracking, it also boasts a zero-tolerance on dust, leaving your home, air, and floor surrounding the litter box utterly dust-free. Although it is a bit more expensive and harder to find than most other non-tracking litters on the market, it is well worth it—giving you a long-lasting odor-protection and can be used in a multiple-cat household. This product is perfect for an environmental-friendly household looking for a simple solution. From the shape and size of granules to its odor, there are so many decisions a cat-owner has to make and so many questions they can ask. Is it compatible with the litter box? Unfortunately, you might come to find out that certain litters aren't as compatible with automatic litter boxes, which can be a real disappointment once you come home and find that out. Some products are biodegradable and some are not. Being environmentally friendly is a huge, important feature because over 2 million tons of kitty litter is dumped into our landfills and isn't biodegradable. It also helps if it can be flushed right down your toilet. Especially if you aren't planning to clean it out all that often or if you have multiple cats under your roof, the odor-control is an extremely important factor in efficiency. Most clumping litters are great for odor-control because they remove the foul smell. 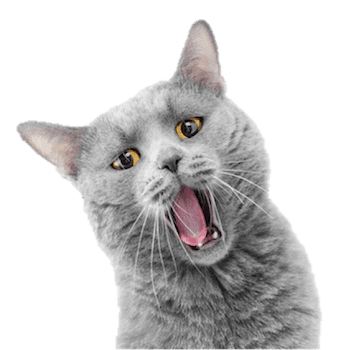 Another major problem most cat owners run into is when pouring it out or cleaning it is the dust that kicks up and out—polluting the air and creating all sorts of health issues for cats and owners. Especially if you have allergies, be sure that the litter you choose has minimal or no dust when being poured or used. Is it made with chemicals and deodorizing perfumes? To mask the smell, some companies infiltrate their litters with unhealthy amounts of additives. Especially if there is a strong (however pleasant) smell associated with the litter, your cat might not approve of it. Ultimately, your cat is the one that will be using it. If the texture or the odor isn't pleasant, they'll be less inclined to use it—meaning more of a mess for you and unpleasant surprises for your other human family members. Cats are also pretty particular about the feel of the texture of the litter, especially if they have sensitive paws. We hope that this guide has helped you sort out the ins and outs of non-tracking cat litter and can lighten the load (literally) on choosing which ones are best for you, your cat, and your home. 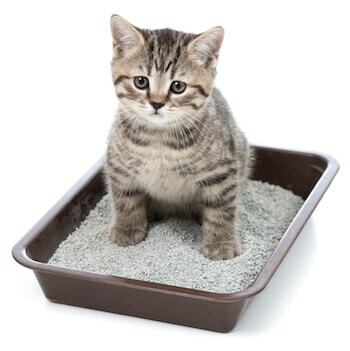 In case you're still unsure if the non-tracking cat litter is the right choice for you, maybe a litter box that cleans itself would be a better option for your needs? Also, these great tips on how to get rid of cat pee smell are undoubtedly useful for every cat owner.